Buying shoes online, or buying anything online these days has become big business. Buying shoes presents a unique problem in that most people do not know their shoe size. Guessing or estimating your shoe size is not a great option, because if the shoes you order do not fit properly you are then forced to send them back. If you have searched the pages of this site for various foot ailments, you have probably become acutely aware that poor fitting shoes are a major cause of foot and ankle problems. Buying shoes online offers the consumer a large selection of shoes particularly for those of you who live in remote areas, plus the ability to buy many shoes at a discount compared to what you find in stores. Many times "hard to find shoes" are only available online. To this end we have put together simple instructions to measure your own foot size. Additionally, we have included a list of the major online shoe retailers, as well as links to their sites. We encourage you to bookmark this page! and return any time you are in the market for new shoes. 3. Stand on the paper and bear full weight. Take a pencil and mark the back of the heel. Mark the longest toe. For most it will be the big toe, for others it may be the second toe or even the third toe. 5. Do this for both feet. If you have trouble standing and reaching your feet, then you may either ask someone to mark your foot for you or as an alternate approach, you may sit in a chair with you feet flat on the floor, bearing pressure on your feet, and then mark the paper yourself. If you do not put pressure on your feet, your foot does not flatten out to its maximum and your measurement will be off. 6. Now measure the distance between the back and front of your feet and record the measurement on a piece of paper. Next measure the distance between the inside and outside of your feet, at their widest part, and record the measurement on the piece of paper. 7. 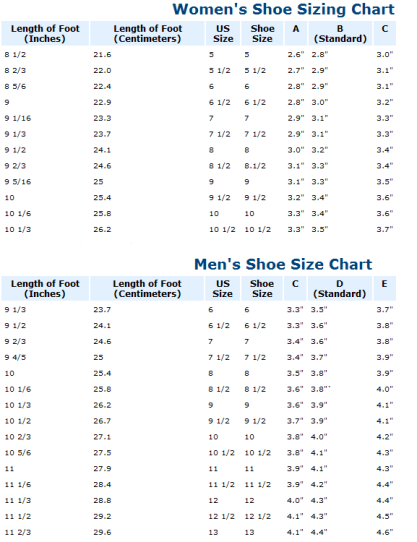 Using the sizing chart below find the length on your foot on the left hand column. If your feet are different sizes, use the longer foot to determine your size. Once you have found your shoe size, look at columns A,B or C to determine your width. Again, use your widest foot to determine your width. You now have your size and width. 8. As a general rule, if your length or width fall between two choices, choose the larger size or width. EXAMPLE: If you are a man, and your larger foot measures 10 inches and the width on your widest foot measures 3.6 inches, your shoe size would correspond to a size 8 and D width. 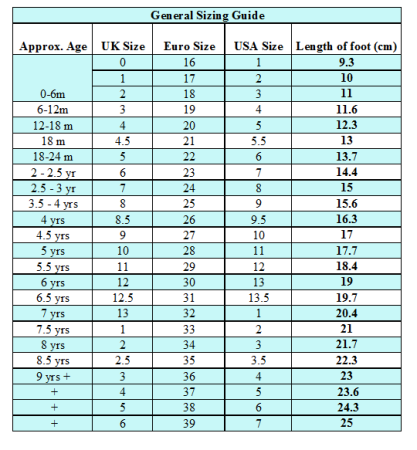 NOTE: in this chart the length of the child's foot is measured in centimeters, not inches. To convert: 2.54 centimeters = 1 inch. So, if your child's foot measures nine inches, multiply 9 by 2.54 which would equal 23 cm. NOW THAT YOU HAVE YOUR PROPER SHOE SIZE, LET'S GO SHOPPING!